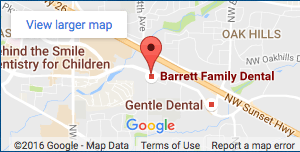 As an emergency dentist in Beaverton, our team at Barrett Family Dental understands the importance of filling a cavity – not only to help protect our patients’ long-term oral health – but also to treat any pain or discomfort they may be experiencing. Unfortunately, treating a cavity often requires causing a patient even more discomfort, as the need to use painkilling injections and drills can result in added stress and anxiety that makes visiting a dentist a less enjoyable experience. While treating major cavities that develop in the center of teeth still require the use of needles and drills, a new breakthrough could offer a simpler, pain-free way to treat smaller cavities that develop between a patients’ teeth. A new clinical trial being conducted by researchers at the University of Alabama-Birmingham’s School of Dentistry hopes to offer patients an alternative treatment for cavities in the near future. The treatment – known as resin infiltration – works to treat cavities that form between teeth. Currently, the only way to treat these types of cavities is by numbing a patient with a shot before starting to drill away tooth structure in order to gain access to the cavity. Resin infiltration, however, would allow Dr. Barrett to slide a perforated plastic sheet between the cavity and the tooth. Instead of the current drill and replace techniques used today, resin infiltration involves cleaning of the cavity using a gel pushed between the teeth that prepares the enamel to accept the resin infiltrant through the perforated plastic sheet. The tooth is then filled by pushing a liquid resin through the sheet. A dental curing light is then used to harden the resin once in place, and the treatment is then complete. This technique allows for the treatment of the cavity without drilling, and the procedure can be completed without the use of any anesthetic. Obviously, researchers believe that a no-drill, no-shot treatment alternative for repairing cavities will prove incredibly popular among patient given the option. And since this treatment option does not require the removal of any healthy tooth structure, it also promises healthier, stronger teeth overall. The resin infiltration is entirely unique, FDA-approved, and commercially available in Germany. However, in the U.S. the treatment is being used only in clinical trials. UAB’s current trial is one of the largest in the country, having enrolled over 150 patients. Researchers believe that if this new system is adopted nationally by dentists everywhere, it could be a game-changer for the future of dentistry. While this new technique helps to restore teeth to health, there are a few prerequisites for patients looking to avoid the needle and drill. This treatment only working on cavities located between teeth or on smooth surface where small cavities have developed. Some cavities that are large or located on top of teeth are not suited for this type of treatment as the liquid resin cannot build up shapes. Fortunately, you can avoid needing an emergency dentist in Beaverton by practicing quality oral hygiene on a daily basis. By brushing twice daily, flossing once a day, and scheduling regular exams and cleanings with our team at Barrett Family Dental, you can successfully lower your risk of cavities and dental disease.